I will hold my hand up now and categorically state that I am a fan of Atrium Carceri and have been from the off. I have never been disappointed with any of Simon Heath’s releases under this banner and luckily, ‘The Untold’ matches my expectations; which I have to admit are always ridiculously high. AC always sets a scene, a play, something to envisage within your minds eye. Opener, ‘The Expedition’ lifts the curtains on a backdrop that places the listener viewing images through sounds of a throng of people outdoors setting off on horseback through the wildest of weather, whilst accompanied by pads breathing as resonating horns. Synth work on ‘The Untold’ flitters between analogue and purely electronic sounds; Heath however, manages to keep an earthly, medieval feel to the proceedings as though everything is purely natural and organic. There is a knack to this art and when the dramatic choral voices sift through the gloom of ‘Unlocking the Seal’, it is done to spine tingling effect. 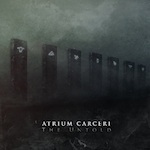 ‘The Untold’ is once again, Atrium Carceri at the top of its game and proving out and out to be one of the finest exponents of Dark Ambient within the genre. With an aural presentation that brings to life a tale that could only be written on parchment, there is a depth and maturity to this latest album that many, simply could not achieve. Enriching, invigorating, subtle, brutal in parts, horrific and majestic in equal measure, ‘The Untold’ approaches from the darkest of nooks and crannies; unnerving yet comforting, with hope filtering through the dimmest of candle lit rooms.